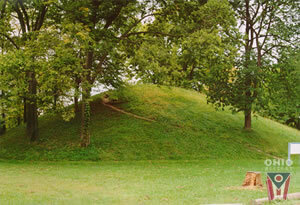 Shrum Mound, sometimes referred to as Campbell Mound, is a conical burial mound built by the people known to archaeologists as the Adena Culture (800 B.C. to 100 A.D.) of prehistoric Native American people. The mound is 20 feet in height and 100 feet in diameter. It has never been scientifically investigated. The mound is named for the Shrum family who donated it to the Ohio History Connection. It is located in Columbus, Ohio and is part of a park named for former Governor James E. Campbell.